Born Dec. 30, 1913 in Ponca, NE to Ellis and Pearl Andrews. Passed away gloriously on September 10, 2012 in Olympia, WA after a brief bout with cancer. Beloved mother, grandmother, great-grandmother and friend of many, she was an eleven-year resident of The Colonial Inn in Olympia. No one there remained a stranger for long. Family trips and gatherings were at the top of her priority list. Other favorite activities included welcoming new residents as they arrived, organizing and participating in parties, bridge games, worship services and maintaining the plants and flower gardens of the Inn. 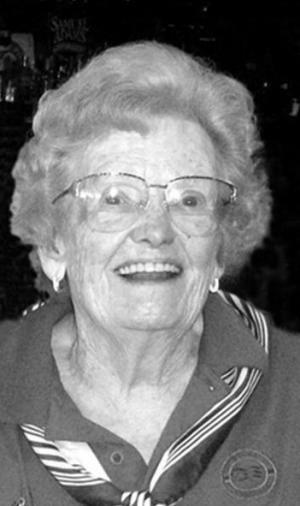 Raised on a Nebraska farm, she met and married Arthur Peterson in 1935. Together they set out on an adventurous life as Art’s professional career took him to many places in the U.S. and around the world. In 1943 they moved to Pullman and after his retirement from WSU in 1974 and a two-year assignment in Iran, to Vista Village in Lacey. As a result of their influence, many lives were touched and blessed, which Wilma continued after Art’s death in 1995. She also was not shy about sharing her conservative political views and was a long-time volunteer at The Freedom Foundation in Olympia. She was a 36-year member of St. Andrews United Methodist Church. She was preceded in death by three younger brothers: Wilson, Merle and Elden (Andy) and a sister who died in infancy. She is survived by sons Paul (Bonny) of Spokane Valley, Allen (Leslie) of Bonney Lake, Wayne of Bellevue and daughters Arlene Arnold of LaCenter and Hannia Fonseca of Carmen, Costa Rica, nine grandchildren, eight great-grandchildren and her three sisters-in-law. Wilma was a devout follower of Jesus and looked forward to being with him and her many loved ones in His heavenly kingdom. Donations in Wilma’s memory can be made to the American Cancer Society online at http://main.acsevents.org/goto/WilmaPeterson or by mail to the American Cancer Society c/o Arlene Arnold, PO Box 232, LaCenter, WA 98629; Reality Sports Foundation, PO Box 2192, Sumner, WA 98390 (www.realitysports.org); or The Freedom Foundation, PO Box 552, Olympia, WA 98507 www.myfreedomfoundation.org. if You’ll renew me too? to walk closer in Thy way. for I can’t walk alone.